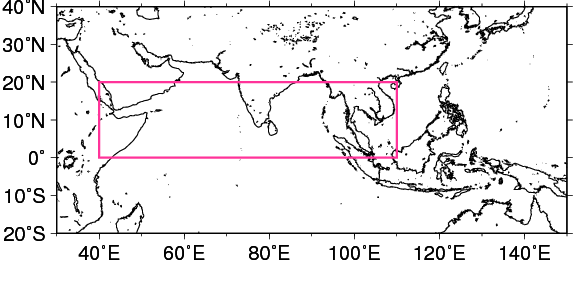 Time-series representation of the zonal wind shear index between 200 hPa and 850 hPa averaged over the North Indian Ocean and southern Asia (shown by the rectangle on the bottom: equator – 20°N, 40°E – 110°E). 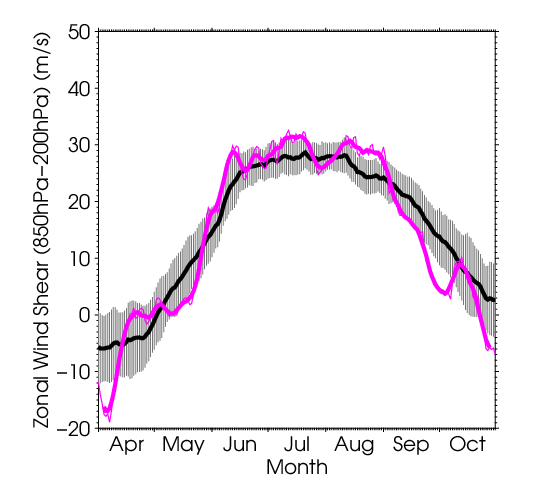 The zonal wind shear index is calculated after Webster and Yang (1992). The thick and thin pink lines indicate seven-day running mean and daily mean values, respectively. The black line denotes the normal (i.e., the 1981 – 2010 average), and the gray shading shows the range of the standard deviation calculated for the time period of the normal.